A collection of 6 stories to put the cubs to bed! Each story is under ten minutes on auto play, making all six great for bedtime reading, even for shared storytime. There are also lightly interactive elements that add both fun and educational reinforcement. Fun details in the stories will amuse and delight as well, like the 'weird' people described in "Goldibear" and the wheat allergy that prevents Little Red Hen's friends from eating her baked goods. Like the other digital Berenstain Bears books from Oceanhouse Media, this title is interactive in a way that enhances early reading skills. Most images (of the bears, their playthings, furniture, etc. ), will name themselves aloud while the word briefly appears over the illustration. For example, touch Sister Bear and "Sister Bear" appears and is spoken aloud by the narrator. 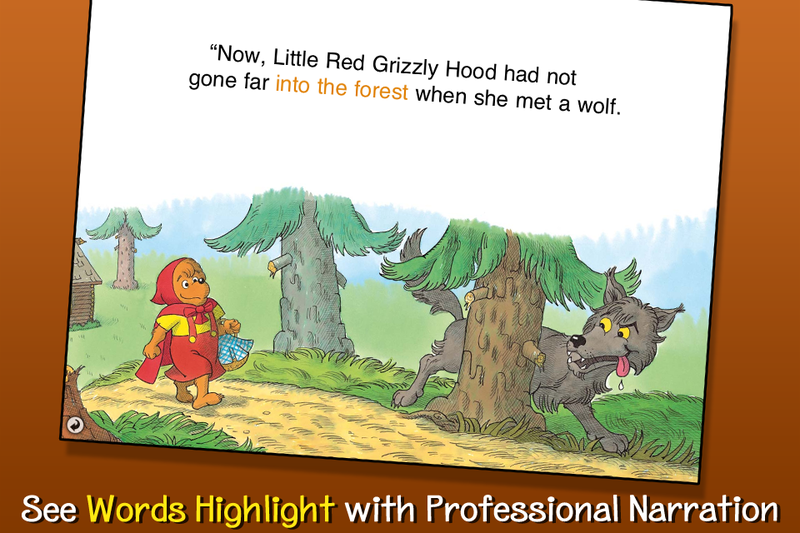 For young readers and pre-readers, the text also highlights as the word is spoken. The Berenstain Bears books have been favorites of more than one generation of parents and children. Now, thanks to Oceanhouse Media, they have a new life in digital. This collection is top notch and has quickly become one of my child's favorite bedtime choices on the iPad. After reading it recently my little boy asked, "Can we get even more Mrs. Grizzle stories, please." Highly Recommended!